Ask fellow campers about "T. O. Fuller State Park" and nearby attractions. Question: How far in miles & minutes is the park from the Bass Pro pyramid? Answer: 10.4 miles, 16 min, which you could have found as easily as I. Very nice State Park. Close to everything in Memphis. Great staff. Visit the Indian Museum in the park. The ranger can get you free tickets when you check in. The road here is very long through industrial areas, but is well marked. We camped at T. O. Fuller State Park in a Motorhome. Nice shaded park close to all Memphis has to offer. Only stayed a night. Odd bunch of what seem to be permanent residents at one end of the park. There is a park host at the other end, but we never had any contact with them. Bath house was about what I would expect from a state park here. Clean enough but could use more. Good hot water and comfortable though. I would not stay here as a vacation destination, but it seems like a good place for a couple nights if you want to explore Memphis. We camped at T. O. Fuller State Park in a Motorhome. Upon arrival, staff was very helpful and camp host was available but not intruding. The bath houses were clean, and warm. Everything works, nothing broke down and over all very tidy. We camped at T. O. Fuller State Park in a Travel Trailer. Ask at check in for a complimentary ticket to the museum that is next door. Nice long level campsites in a very scenic setting. Very nice bath house and an excellent hiking trail. The two negative aspects are a poor signal for Verizon and the sewage plant nearby. We camped at T. O. Fuller State Park in a Motorhome. Visited Beale Street and listened to some great music and eat some great food. Stayed in site 23. Very shady. Clean restrooms. Only heard a few trains and planes. Sites were paved, level. Rangers were very nice. Pool did not open on time one day because no lifeguards were available. Free ice machine. Typical cleanliness for state park. Laundry facilities available. Must drive through sketchy neighborhood but feels safe, secluded and patrolled by rangers. No smell when we were there. It did not rain so smell was not present. Mosquitoes were not bad either. Plenty to do. 6 mile trails, pool, basketball courts, Indian archeological site, close to Memphis. We stayed in a pop up trailer. We camped at T. O. Fuller State Park in a Tent Trailer. STINKS. They should call it T.O. Stinker State Park. It's located next to a sewage processing plant. To quote the movie Christmas Vacation: "I pity anyone who lights a match within 100 yards..." Woke up to an intense sewage smell. They should relocate the park away from the sewage plant. We camped at T. O. Fuller State Park in a Motorhome. Make sure you are downwind. This is a gorgeous state park. The office staff and rangers are so kind. Bath house and laundry room are good. Free ice. I definitely recommend this park. You have to come through an industrial area to get here but don't let that dissuade you. Once you get to the park you can't even tell you're this close to the city. We camped at T. O. Fuller State Park in a Motorhome. Which dog farted? Laughed as folks pulled in and looked around to see where the dog fart smell was coming from! An OK state park once we got there. Lots of research, Truckers GPS and we still saw NO TRUCKS signs and were routed through a neighborhood with narrow roads. CALL the park for directions! Nice Park Ranger gave us good directions out the back way so we had an easy departure (BUMPY railroad tracks though. We camped at T. O. Fuller State Park in a Fifth Wheel. Lovely wooded area. Camp host present, and helpful. Good hiking, biking. We camped at T. O. Fuller State Park in a Motorhome. I wish I could say wonderful things about this park because we love to support state parks but it is simply okay. It's a tired old park that needs some love to make it better. The sites are all paved but un-level. Either sloping front to back and/or side to side. In fact our original site, a pull though, was so bad we had to move to a back-in. The camp host was very nice and helpful in that regard. Do Not use any of the pull though, 4-9, because they are all so un-level. The park is quiet but there is a smell coming from the refinery near-by on occasion. We stayed here 2 nights to visit downtown Memphis. Not very good 4G but regular cell ok and satellite was "okay". As I said it's a tired old park that needs some love. We camped at T. O. Fuller State Park in a Fifth Wheel. We like the campground, but we generally prefer state parks to the resorts. 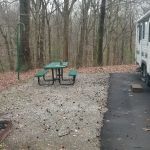 The campgrounds is being refurbished with newly paved sites. No sewer available at the site, but there is a two-lane dump station. Nice hiking trail around the area, but it can get muddy. The bath house could use an updating, but it's reasonably clean. Down side is there is currently no hot water in the bath house. They are waiting on a water heater. It would have been nice to know that before we reserved. We camped at T. O. Fuller State Park in a Fifth Wheel. We enjoyed the ornamental metal museum and a walk on the railroad bridge over the Mississippi river. Had a good dinner at Central BBQ. Intended on touring the Gibson factory but missed it. If is has been awhile since you've used T.O. Fuller or if you've never been there you are in for a delightful surprise. The sites are large, some with new paving, new metal tables, and wide clearances from trees for large units. Some sites are pull through. Our back-in was 76 ft long, putting us well off the road. The maintenance is superior to other TN state parks I've used. The only negative to prevent a 10 is there are no sewer hookups. We camped at T. O. Fuller State Park in a Travel Trailer. Walmart Supercenter on Elvis Pressley is about 6 miles away and provided the needed antifreeze. I liked this park - and didn't like this park. First the pros: The price reflects 1/2 price as of 12/1 plus a senior discount. Our site was pretty level, treed, paved and clean. The shower/bathrooms were the warmest I have ever experienced this time of year. And there was plenty of very hot water. Laundry (in a state park?!?) was clean and cheap. ATT cell service was fine for web surfing and writing campground reviews. The staff at the visitor center were extremely friendly. And the one hiking trail was excellent, with lots of terrain change. Cons: You have to drive through some pretty bad neighborhoods to get into town...lots of abandoned houses, businesses and trash on the side of the road. And then there is the smell. We had it one day when there was a NW wind, which ,when I googled waste treatment, was where it was. So, my advice is come stay here but check the wind direction first. We camped at T. O. Fuller State Park in a Travel Trailer. Stayed here for two nights on our drive to New Mexico. Park was very nice and well kept. The only problem we had was with the TV reception and lack of Cell Phone coverage. Could only get around 6 channels on Using the antenna and the 6 channels did not include ABC, CBS or NBC. We have Verizon for our cell phone service and the signal was very weak, if you are lucky to have any signal at all. Would not have been an issue but I depend on having decent cell phone signal for our business, lots of dropped calls We camped at T. O. Fuller State Park in a Motorhome. The park is large, mostly shaded level sites. The camp host and rangers are very visible and helpful. Site fairly level - only negative is no sewer, but pumpout station at entrance/exit to campground. It was easy to drive in to Beale St, museums and Graceland. We enjoyed our stay and will be back to visit this park as well as the area museums we didn't have time for. The turns/overhangs in and out of the park are tight, but doable. Memphis isn't known for their road quality, so there are some bumps, but again doable. Facilities very clean. We camped at T. O. Fuller State Park in a Motorhome. Rizzos for dinner and Sunday brunch; Civil Rights Museum, Rock and Soul museum were fabulous. Rizzos was easily our favorite restaurant in Memphis. Graceland, Beale Street, Civil Rights museum, see the Peabody ducks at 11 and/or 5 pm, Sun Recording Tours. Eat some good food. We drove an hour into Arkansas to Dyess to see Johnny Cash's Boy hood home which is taken care of by Arkansas State Univesity. THE BEST SIDE TRIP! The town was founded only in the early 1930's as part of FDR's New Deal. So much history and so interesting. This park has been occupied but equally empty during my stay. They do take credit cards via the Park Ranger. I called about an hour ahead of my arrival and reserved a site. Beale Street, Bass Pro Shop Pyramid, Graceland, the Memphis Zoo and other attractions are all within 15 minutes. Also within 15-20 minutes is the Mississippi State line where I found many shops including a Dollar Tree and WalMart. Would I come back? ABSOLUTELY! 15 minutes to Beale St and Graceland. Nicer drive into Memphis by going west along Mitchell Rd to Riverfront. For great breakfast or lunch try the Blue Plate Cafe downtown. Great southern cooking in a pleasant atmosphere at reasonable prices. Great vegetable plate for vegetarians. The Sun Studio tour is fun as is the Stax Museum. Then there is the Lorraine Motel with the Civil Rights Museum. There is a reasonably priced riverboat tour along the Memphis waterfront. There is also a new pedestrian/rail/bicycle bridge across the river. Bring mosquito repellant. It's hot and humid, welcome to Memphis. Go downtown during the day and walk Main St and other streets off of Union. Graceland is not far from the campground if Elvis is your thing. Try some BBQ. Beale Street is nice, but there are some areas downtown that are high-crime. Never before have I entered a restaurant with armed security inside. Don't get far from Beale Street (there is a strong police presence) after dark. About 15 minutes to groceries etc. Lots to do in Memphis. Motorhomes pulling a towed vehicle should disconnect towed vehicle prior to entering campground. Our RV GPS tried to route us off the main stretch of road to the park to go through a neighborhood. I am guessing because there are No Truck signs posted on the road. Besides a old bridge, it is safe to stay on the main road. The road continues out of the park, so I assume they don't want commercial traffic cutting through the park. What to say, it's Memphis! Rendezvous BBQ for dinner, Little Tea Shop for lunch, Graceland, Sun Recording Studio tour, Carriage ride down town. I spent a little time in Memphis, but I was only here for a few days. I was a little disappointed with some sections of the city. Very run down, many buildings deserted. I didn't get to go to any museums and I heard they were nice. The roads in Tennessee are some of the worst I have seen so far. Even the interstate had huge potholes. Not good when you're pulling a fifth wheel. I ended up having a flat tire on my truck during my stay here and had to replace the tire. I did go to the Chucalissa indian mounds and exhibit in the park near the campground. It was interesting and a free pass is included with your stay. I tried to go to Graceland and was disappointed and turned around. They want $10 to park and $30 to get in the building. Not to mention you would have to wait for two hours in the heat. No thanks. Are you affiliated with T. O. Fuller State Park ?